Five days a week or 40 hours is the standard for full-time employment. Working 50 to 70 hours isn’t unheard of though. Are the extra hours worth it? The studies and real-life examples showing the relationship between working hours and productivity might surprise you. The extra time you spend in the office isn’t always productive. Emails:The average employee checks his inbox 36 times an hour. 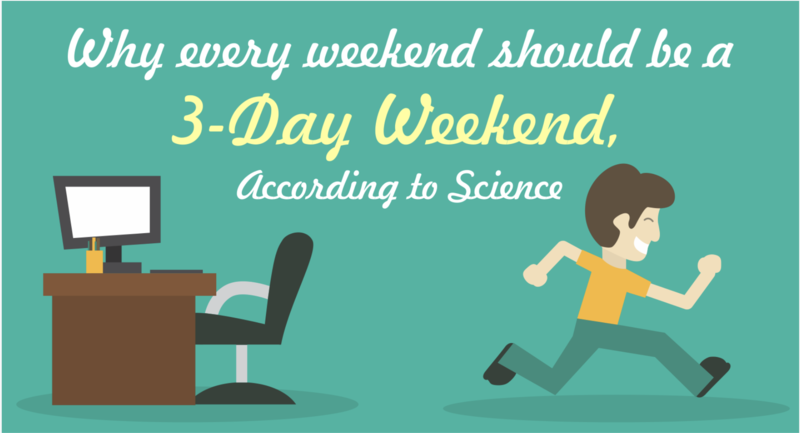 Contrary to popular belief, shortening the workweek isn’t just for employees. DO YOU WANT TO SUGGEST A 3 DAY WEEKEND TO YOUR BOSS? Show how other companies are thriving, despite the extra day off. KFC Japan rolled out a 3-day off initiative to fight labor shortage and retain more employees, especially stay at home moms. They quickly convinced more than 20 moms to return to work after implementing the program. CEO Jason Fried said, “Better work gets done in four days than in five.” Basecamp employees are more focused and creative because of the compressed workweek. Share this infographic to your friends, co-workers, and even your boss. It’s time we end the misconception about long work hours and productivity. Besides, we could all use an extra day off.